Red Cross responding to a 3-alarm fire on Decatur Ave in the Bronx. In the last week the Red Cross provided emergency relief in the form of shelter, food, clothing, health services and/or emotional support to 97 New Yorkers impacted by 35 disasters across our region. Here are some highlights. Every year on Sept.11, we reflect on that fateful day in 2001 and on the trying weeks, months and years that followed. We do so to honor those we lost, to comfort those still grieving and to thank those who gave of themselves to help us heal. There were two Sandy rebuilding efforts last week. Volunteers from JetBlue Airways worked with Red Cross partners, Friends of Rockaway, on Sept. 13 to help repair two homes damaged by Sandy. 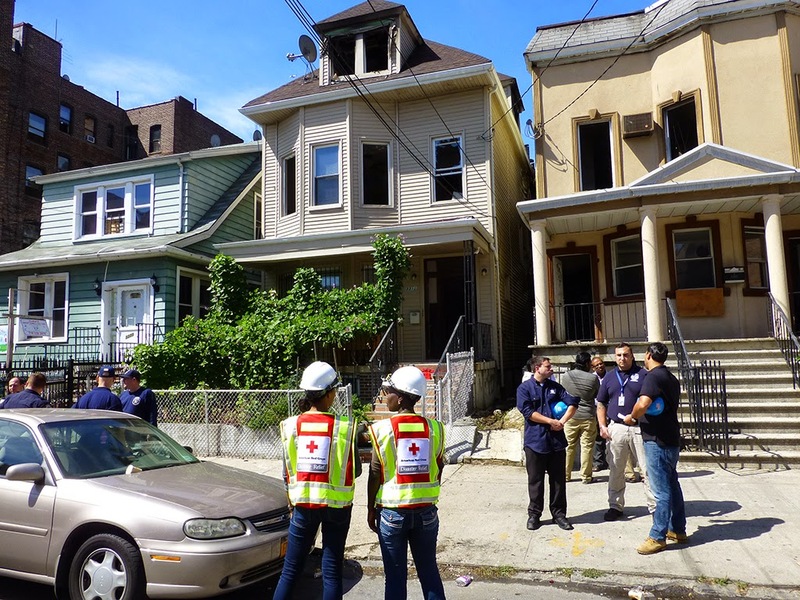 Earlier in the week, volunteers from Holland & Knight worked with the Red Cross and Friends of Rockaway to help repair another Sandy-damaged home. On Sept. 10, the Red Cross responded to the scene of a 3-alarm fire that damaged three buildings on Decatur Ave in the Bronx and left three families (11 adults and 3 children) homeless. We provided emergency housing, food, funds for basic necessities as well as emotional support to those that needed it. On September 9, the Red Cross setup a reception center with Yonkers OEM to help four families displaced by a fire in Yonkers. Translation assistance, financial assistance for personal items and referrals to community partners was provided for those families to assist in their road to recovery. In the second week of National Preparedness Month, we have preparedness tips for seniors and an action checklist for people with disabilities. Nat'l Preparedness Month is also the perfect time for you to prepare your pets for an emergency. Check out the Top 21 Most Prepared Dogs of NYC on BuzzFeed. Thanks to our friends and partners at The Good Dog Foundation, for helping us! Greater NY Representatives Meet with Brooklyn Deputy Borough President Diana Reyna to discuss Red Cross disaster services in Brooklyn. A great time was had by all at the LI Volunteer Appreciation picnic on Sept. 6. Close to 100 volunteers showed up at Babylon’s Phelps Lane Park to enjoy great food, play Long Island trivia, participate in cot races and more.